2018 was the year of increasing application of blockchain tactics in supply chains around the world. Previously relegated to the realms of cryptocurrency and financial technology, blockchain saw adoption across Canada in governmental, educational, and trade contexts. The Southern Alberta Institute of Technology became the first school in Canada to issue graduate credentials through blockchain, the fledgling Canadian cannabis industry took at look at how blockchain could help keep things legally transparent, and even the Canadian government started getting in on the game with a funding competition for applications related to agriculture. No longer just a fringe buzzword for tech-heads, blockchain is here to stay and grow. When it comes to the supply chain, strategists and logistics experts around the world have been digging into the possibilities of blockchain with interesting and innovative results. Given 2019 is gearing up to build on the increasing move into the mainstream blockchain saw last year, we think it’s time to brush up on what big players around the world are investing in. Counterfeit merchandise carries a global cost of billions of dollars, while counterfeit pharmaceutical products lead to nearly a million deaths a year worldwide. Blockchain’s transparency gives the supply chain a powerful tool to combat counterfeiting. Pharmaceutical supply chains combining blockchain, IoT, and the process of serialization create a trustworthy importing and exporting environment where every player is sure that the drugs passing through their supply chain are legitimate and safe. The ability to track every step a drug takes along its journey means full transparency and accountability, stopping counterfeit drugs from entering the supply chain at the start. Tracing the journey of goods from origin to destination is a regulatory must, particularly within safety-sensitive supply chains such as the food supply chain. Blockchain is particularly good at facilitating track-and-trace systems, and allows track-and-trace tools already in place to scale exponentially. Real-time traceability allows facilitates better efficiency in food supply chains, as the freshness and safety of perishables can be tracked with accuracy unheard of previously. Improved traceability of stock also means more cost-efficient management of inventory throughout the supply chain with real-time updates on stock levels, cutting back on the need for buffers. The transparency and traceability of blockchain applications means that secure automated payments can pass through the supply chain with unprecedented levels of trust. The ability to securely track and trust automated payments on blockchain frees up human effort, allows for more efficient business, and ensures relationships are always smooth as everyone is always paid on time, and transparently so. Within the supply chain, this means automated payments can be made the second shipments arrive at a port, not before or after. The supply chains in the food sector need to be quick, traceable, and safe for the secure handling of food worldwide. The potential for blockchain to aid in the rapid identification of sources contamination in the supply chain is vast, as identified by the Carrefour Group in Europe. They’ve launched a blockchain to trace their chickens, eggs, and tomatoes as they move from farm to store. Carrefour’s blockchain application can cut the time needed to check food safety down to mere seconds, freeing up days or even weeks that would have otherwise stalled the supply chain. With preliminary success in quickly identifying potential sources of contamination, Carrefour plans on expanding the system to encompass all of its output around the world by 2022. Other supply chains and providers in the food sector are likely to follow suit. 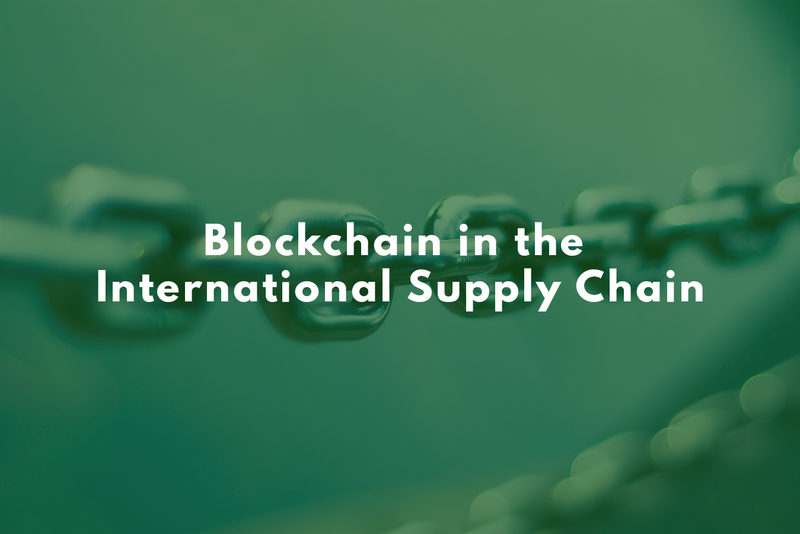 With global trade in a constant state of flux, increased blockchain accountability and traceability will help importers stay compliant to environmental, safety, and counterfeiting regulations in the food sector and beyond. Have a question about importing anything securely? Contact us today!